High Noon Casino boasts a distinct western flavour and you can even grab a welcome bounty of $60 with a very generous no deposit free chip. This is one of the best no deposit promos around at the moment. It certainly gives you a fighting chance of winning enough to go on and meet the wagering requirements. You just need to enter the bonus coupon code SIXSHOOTER to claim. If you exhaust the free chips and wish to deposit, you can benefit from another High Noon Casino Bonus. 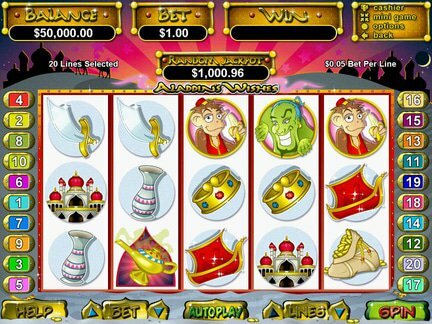 The 200% deposit match up to $2,000 using HIGHNOON200 is a pretty good reason to pay in a little of your own money and try for a big win on the slots. If table games are your thing, there is a dedicated promo for you too. The table games bonus is a little smaller, consisting of a 100% match up to $500 wiht the bonus code: HIGHNOON100. You can also earn comp points as you play which, once you have enough, can be converted into yet more free chips to play with. Regular weekly specials round off the available range of incentives and rewards which, in all, is quite extensive when compared with Bovada Casino, for example. If making use of bonuses to mitigate risk is important to you, this brand should be somewhere near the top of your "must visit" list. It will surely be right at the top if you have an iPad or iPhone, since the company recently launched an app for Apple mobile devices (No Android yet). Finally, don't forget to look around on the internet, because there are occasional free spins bonus voucher codes on offer. High Noon Casino has understandably become very popular in the USA, not only because players here are welcomed, but also because it's genuinely one of the better US friendly providers. The brand also has a popular following in Canada. If you run a search on High Noon Casino Jackpot winners, you'll quickly come across a very famous winning player. Simply known as Mr. S, this member deposited $350, played conservatively for a few days and then decided to up the stakes. As it turned out, his move was good and landed him two big Jackpot wins in one weekend. He was playing Triple Twister slot and his first jackpot landed after he hit some free spins. Before he knew it, there was a shade under $250,000 in his account. His second stroke of incredible luck arrived in exactly the same way, on the same game and he made another $168,960. These wins are well documented and publicly celebrated by the brand as well as the player. If you are a bit of a doubter when it comes to the winning potential of internet wagering, this piece of news serves as proof positive that winning a big jackpot is far from impossible. The Real Time Gaming progressive slots are well-known for high winning potential. Therefore if you can find a good free spins bonus coupon code for one of these titles, it's worth using it to replace your no deposit option. Alternatively, you can always use the no deposit promo and use it to play progressive games exclusively. Sometimes it seems every silver lining has a cloud, in this case it is the number of unresolved complaints about this brand. Most of the issues relate to voided winnings and obscure terms being used to deny players the opportunity to cash out. While some of these complaints have clearly come from disgruntled players crying foul, others certainly stretch the concept of fair terms and conditions. For this reason, the company rating is 3 out of 5 for complaints and handling. This internet gambling service is owned by the Club World Group, a very highly regarded company in the internet gambling industry. Club World established this brand in 2010 since when it has been licensed in the UK. 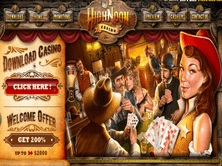 As High Noon Casino has a good reputation among mobile gamblers, we decided to try it initially on an iPad and iPhone devices. The sign up form is very straightforward, easy to read on a small screen and it had us registered with the provider in moments. Depositing through the mobile cashier was also a breeze, as was the claiming of coupon codes for the welcome offers. Hopefully there will soon be an app available for Android tablets and phones as well. Although there is only a very small selection of slots available to play on a small screen, those available are all popular titles. They loaded quickly, looked good and played flawlessly. Returning to the download software for PCs, we made use of the voucher code for a $60 complimentary chip and tried our hands on some table games as well as the popular range of slots. We found the western theme to be quirky and fun. Navigation of the site was straightforward and we really liked the instant switch feature. This saves a lot of time and gives you the convenience of switching between your favorite games without returning to the lobby every time. It does feel like the company behind this brand has thought of everything. If it wasn't for the slight concern about unresolved complaints we might have given a much higher rating. As it stands we feel 3 out of 5 to be fair at this point.